1. Brad Ross, Forward, Portland Winterhawks WHL – 2nd round pick back in 2010 has really been developing his all around game this year. Learning to pick his spots better as his penalties are down and his scoring is up. 2. 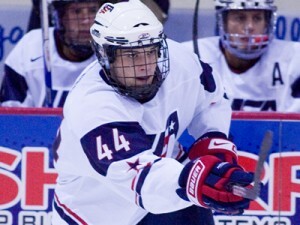 Tyler Biggs, Forward, Miami Redhawks NCAA – Projected power forward who is finding out college hockey is no joke. Last year’s first rounder will only get better as he develops his game down in the NCAA. 3. Greg Mckegg, Forward, London OHL – Had a slow start on a brutal Erie team, but since being traded to powerhouse London he has been on fire. Watch Greg to lead London’s charge all the way through the playoffs in the coming months. 4. Korbinian Holzer, Defenseman, Toronto Marlies AHL – Lanky German has really came along well this season for the Marlies. Look for Holzer to get a call up if the Leafs are busy at the trade deadline. 5. Stuart Percy, Defenseman, Mississauga Majors OHL – Had a great start to the season and Leafs were really high on him coming into the year. Unfortunately been out most of the season with a concussion and there is no timetable on when he will return. 6. Jesse Blacker, Defenseman, Toronto Marlies AHL – Had a great junior career where he seemed to get better every season. First season as a pro has been up and down, but the Leafs have a good one here and just have to stay patient. 7. Jerry D’Amigo, Forward, Toronto Marlies AHL – After a rough first year as a pro Jerry has really stepped up his game this year with great two way play. Really uses his speed well and looks to be a great checker for the Leafs in the coming years. 8. Josh Leivo, Forward, Sudbury Wolves OHL – Most were shocked when the Leafs took the underrated junior out of Sudbury last year. Since then he seems to be one of the steals of the draft as he is having a great season and improving at a rapid pace. 9. Jamie Devane, Forward, Plymouth Whalers OHL – Having a great season for a well coached Plymouth team this year. Really rounding out to be a great pick by the leafs who surprised many with taking him. Skating has improved and always seems to be the biggest guy on the ice. 10. Marcel Mueller, Forward, Toronto Marlies AHL – The powerful German is having a good second year with the Marlies. The leafs should not wait too long on giving him a shot though as he is already 23 years old and not getting any younger. -Does not include any player over the age of 25 or any player who has played at least 10 NHL games.